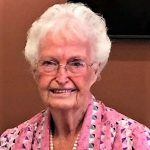 Jean Edwards, 87, of Bluff Dale, passed away on Monday, December 3, 2018. Service: 11:00 AM, Thursday, December 6, 2018, Wiley Funeral Home Chapel, Granbury, Interment: Brooks Cemetery, Visitation: 6:00 PM -8:00 PM, Wednesday, December 5, 2018, Wiley Funeral Home, Granbury. Jean was born on December 31, 1930 in Paluxy, Texas to Ben and Montie Wann. She married Dalvin “Buster” Edwards on July 3, 1948 in Tolar. She cherished time spent with her family and was a loving and caring wife, mother, and grandmother. She enjoyed traveling with her husband Buster and fellow senior citizens all over the United States. Jean enjoyed vegetable gardening and canning fruit from her fruit trees. She was a faithful member of Cottonwood Baptist Church outside of Glen Rose. She was preceded in death by her parents, husband, “Buster” Edwards; sons, Dwayne Edwards and Benny Edwards; and grandson, Dustin Swaim. Jean is survived by her daughters, Rita Rudolph, and Donna Morgan and husband, Danny; seven grandchildren and nine great-grandchildren. I have fond memories of Jean and all her family. She’s up in heaven celebrating with Buster, Dwayne and Benny. My mom and dad will be ecstatic to see her. Love all of y’all.